Tương thích ngược với chuẩn 802.11b / g và 802.11a. 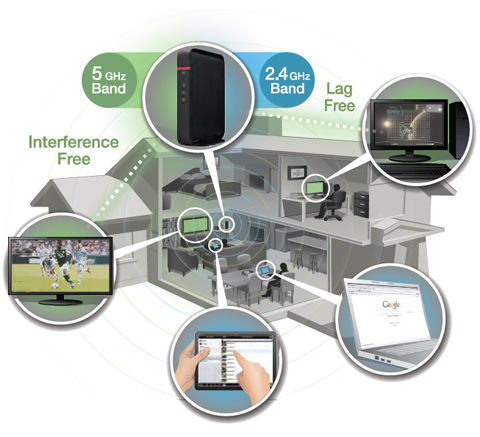 Dual Band Home Networking Connects You to Your Content at Speeds up to 600Mbps! Offering simultaneous wireless operation on both the 2.4 GHz and 5 GHz bands, the AirStation™ N600 Dual Band is perfect for streaming HD movies, music and emailing from multiple devices at the same time. Dual Band N600 offers concurrent high speed wireless connections with up to 300 Mbps on single band and up to 600 Mbps* on both bands. AirStation™ N600 Dual Band features an easy-to-use, step-by-step setup wizard that guides you through configuration from start to finish. Within moments of opening the box you will have a secure wireless home network. Easily upgrade to your network and maintain compatibility with existing adapters and devices. AirStation™ N600 Dual Band works with any new Wireless-N device as well as the previous generation Wireless-G.
AirStation™ N600 Dual Band features multi-level wireless encryption options to prevent unauthorized access and protect your important data.